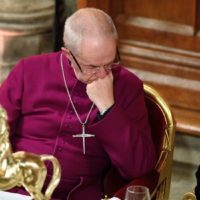 Home » Blogs and Links » Justin Welby: Catholic or Protestant – who cares? Sadly, I thought Justin Welby was more principled than is revealed in the Spectator article. The order of his words is telling – vocation before Jesus. There are other disturbing issues in the article – to have a Roman Catholic as his spiritual advisor must raise some questions.I quote “He has a Catholic priest, Fr Nicolas Buttet, as his spiritual adviser. One of his closest friends, he says, is Vincent Nichols, the Catholic Archbishop of Westminster. Bridge building easily leads to compromise – the gospel is uncompromisingly wonderful and cannot be added to or watered down! Should we discuss the gospel with Roman Catholics – YES! Help them to see and understand the beauty of grace. Do we need to consult the pope on gospel matters? NO – the Bible is sufficient!